Canonical is integrating a music store with the next release of Ubuntu, that is Ubuntu 10.04 Lucid Lynx. Blogger Alan Pope have posted some screenshots of the new music store. 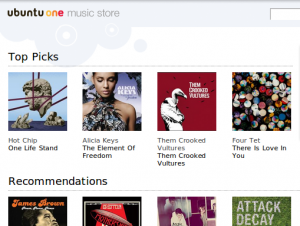 The Ubuntu One Music Store will be powered by 7digital, a privately owned digital media delivery company based in the UK. 7digital's clients include brands like Spotify, and social networking sites Last.FM & Bebo. Tracks offered by 7digital for the Ubuntu One Music Store will be available in MP3 format without any DRM. You can download tracks once, then put them in your Ubuntu One or Dropbox so they’re synced (and effectively backed up) across your machines. The store is expected to be integrated in Rythmbox in time for the Ubuntu 10.04 Alpha 3 release. This means that you can buy your favorite tracks right from Rythmbox. I must admit I have never heard of 7digital before today. But after looking for some of my favorite songs, I must admit that they have quite a good collection at a reasonable price.